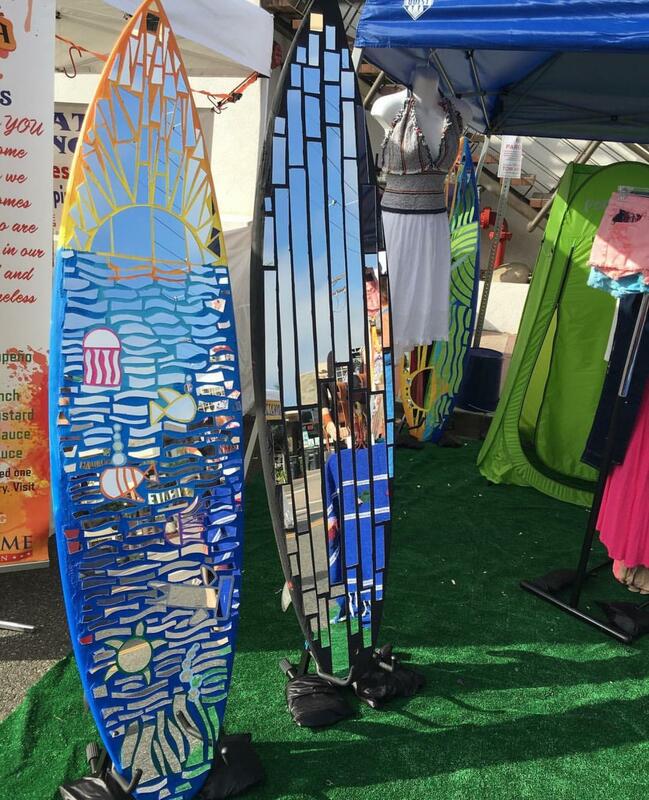 This surfboard stand is completely free standing. No need to screw anything into the walls and is very easy to move. Take it to your beach house in the summer and bring it home for winter storage. 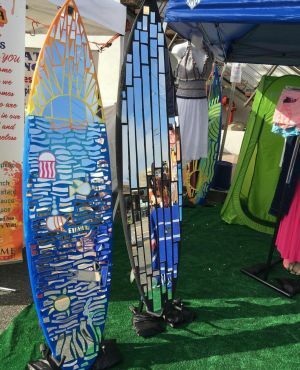 A nice display stand for your surfboard! What boards does it hold? This surfboard stand is best suited for shorter, lighter boards. It can accommodate most any fin setup, but does not require fins to secure your surfboard in the stand (unlike some stands/racks). The width of the stand adjusts to 1 of 4 settings easily with adjustable push pin. For a more robust stand (for heavier boards and longboards) check out the Longboard Surf Stand. Howdy! I’m Andrew from StoreYourBoard.com here to talk to you today about our Freestanding Surfboard Rack. You can see the rack next to me. I’m going to show you how easy it is to use. We’ve got thruster surfboard in the rack. I’m going to take that out, set it aside for a minute. Take a look at the rack itself. The rack itself is pretty small, pretty simple. It comes with three pieces to support surfboard. There are two base pieces, and there’s this top piece that your surfboard will lean against. The base pieces are covered in foam, so you really don’t have to worry about ding or damaging your surfboard when you’re putting it in the rack. I’ll show you the back for a minute because the rack itself is adjustable. There is a push button right here, and there are four settings that you can set it to. You can go wider or you can go narrower. I myself have to do with a third setting here, depending on your size board and the tail that you have. You can adjust it as needed. So I’m going to set the surfboard rack up on the ground, very simple. I’m going to get my board again. Again I mentioned that I have my fins in. Some of our freestanding surfboard racks depending may not fit your fin setup. This one should. There’s an indentation in the support pieces. You want to make sure that you get your surfboard tight into that groove and set it back against the backrest, so it sets up straight and that’s how easy it is to use the surfboard rack. I am going to mention that it doesn’t have a very tall support piece in the back. So we’re not going to recommend this rack for particularly heavy boards, particularly longboards, or even for using this rack in a place in your house or garage that is really well traveled because it is not as steady as some of the freestanding racks that we have. That said, it’s a very affordable rack. It will work great to display your surfboard, and as I mentioned, you can use it with a variety of different surfboards and with some different fin setups. Check it out today on our website, StoreYourBoard.com. Wondering if the "Surfboard Stand | Free Standing" rack will be able to fit SUP boards? 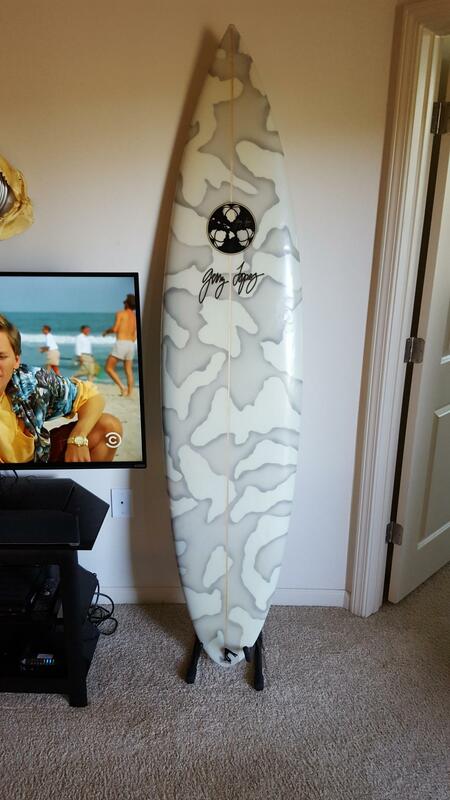 (10'6" up to 12') I know there is an extender for long boards, but I'm not sure if it will accommodate a stand up paddle board. If not, do you have anything similar? Can your stand hold an 8ft board? This particular stand is really best for boards up to about 7 feet long. Boards larger than that won't be as stable on the stand, and it isn't recommended for boards over 8 feet long. The long boy stand works with boards up to about 9'6" inches tall, though to use it, your board has to have a center fin. Can this Surfboard Stand hold a Stand Up Paddleboard (SUP)? I'm interested in this freestanding surfboard stand for my new 6'4" fish. Do you ship to Australia? We can ship some of our board storage and display racks outside the United States. Contact us at info@storeyourboard.comand we will get you a shipping quote for any item that available for shipment to your location! 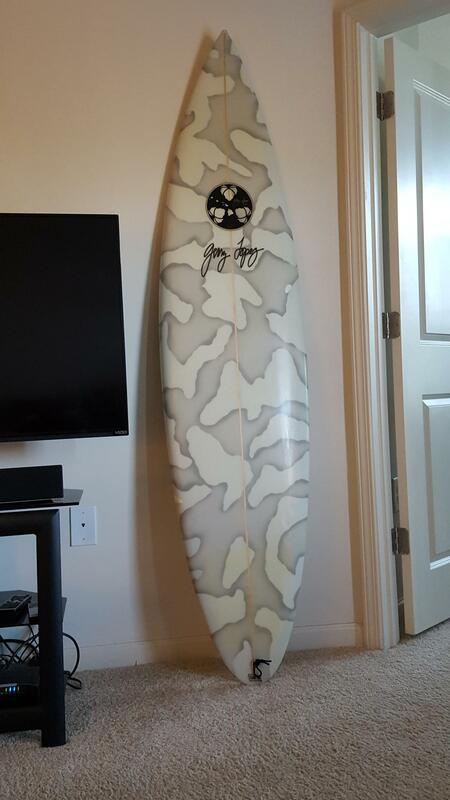 I have a 6'6" fish board, can I display that front and back? This surfboard stand should work fine for your fish board, and you should be able to use it with your fins facing in or out. Would this work for the walden mega magic 7'2 board? This surfboard standwould not be recommended for a board over 7' tall. We would recommend this longboard surf stand instead for your board. Can this product be used for Stand Up Paddleboards? This surfboard stand will not work for a SUP, due to the size and shape of SUPs being different enough from surfboards, this freestand won't be able to hold it properly. We do have some freestanding racks for SUPs, which you can find here, for consideration. Does the surfboard touch the ground when using this stand? 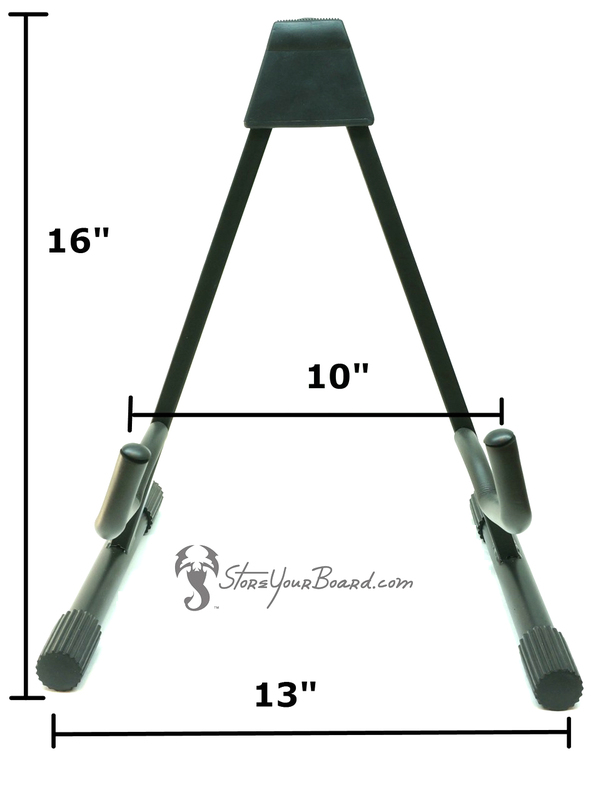 Your surfboard won't be resting on the ground with the Outlaw Stand. It will be held in the arm brackets above the floor, and the stand can be adjusted, narrower or wider, depending on the shape/size of your board. I have a 9'4" single (glassed in) that's pretty heavy. Is this the right product, or do you have something that's a better fit? We do not recommend this stand for longboards - it just doesn't work for them. There really aren't many options in freestanding racks for boards over 9 feet (for example, these display stands work for boards up to 9 feet), so once you are getting over 9 feet, we don't have a good alternative in freestanding options to suggest, especially if its a heavier board. I know you said boards up to 7', but I have a 7' modern blackbird and am wondering if I should get this stand or the longboard stand? For a 7' board, the longboard surfboard stand is a better choice in a freestanding rack, and would recommend it as more stable and a better option for your board. What’s the maximum size board will it hold? This Freestanding Board Rack can hold a board up to about 7 feet maximum in height/length. It works better for shorter boards. Great for all over fiberglass boards... anything else is a bit dicey! 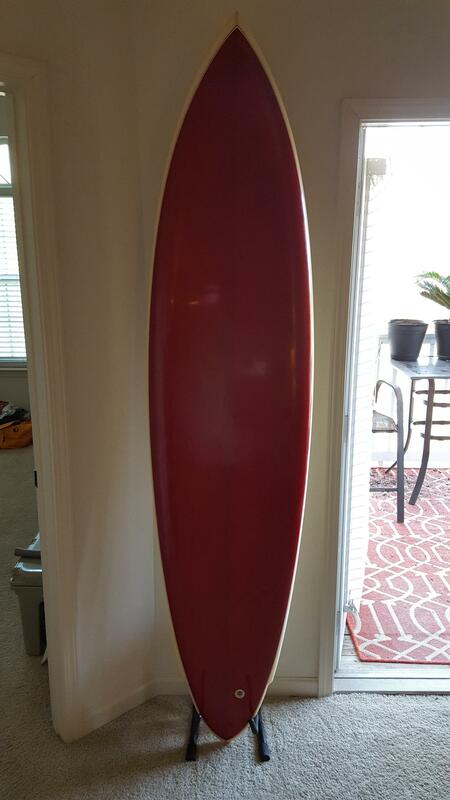 These stands work great for a traditional fiberglass shell surf board. However, if you are attempting to display boards that are a blend of materials (foam, softer plastic, etc) they don’t do the trick. The stands would need to be used in conjunction with a wall, but can’t be free standing. Event though this is a regular GUITAR STAND that usually costs only 7,- !!! Hi - Love the stand but feel it has one major flaw. The rear legs are shorter than the front and a shortboard barely stays upright without falling backwards. I think a simple solution would be adding a few more inches to the rear legs. Since the board already leans back, it would add more stability. I have a 5'8" on the stand and i need to weight down the front as not to fall over. The stand arrived in a timely fashion and showcases our surfboard beautifully. Thanks! We ordered this stand and needed expedited delivery. It arrived on schedule and performed well. I have bought 3 !! Great design,great price,and fantastic customer service!! Love it!,quality product and a great price! !I will get anothervone!. I bought several of these to display the art boards that I make and sell. These stands were easy to take with me and set up and they held the heavy boards fairly well. They were a great addition to my set up. We bought the single board storage for the garage and it's great. We will be back for more products! The stand arrived in a timely manner. It looked and performed as advertised. I am very happy with my purchase. I bought two to use for my 7' boards. It's probably a better choice for short boards but I have them near a protected wall and they look great and do what I want. I got this surf stand because I was looking for an easy rack to hold my short board. I looked at some of the racks you mount to your wall, pretty sweet lookin some of them, but I thought this would be easy for my apartment. I was right. All you do is get this stand out of the box, spread it apart and place your surfboard in it. It actually looks really cool having my board in the corner of the room in the stand.